Well I’ve really got going with the orders from the trade fair, mostly the embroidered cards I make to pay bills and that sort of thing, and to fund short breaks in Belgium or wherever. It did strike me that although it is undoubtedly a bit boring to do,at least someone wants them, you get paid for them, and it makes you very efficient in the simple technicalities of stitching a lot [I do them by hand so they are nicely portable too, front of tv sort of situation etc] which builds up stamina, especially mental stamina, and it helps with one’s more complex [proper] work in subtle ways too, in that you don’t get so fazed if there’s a lot to do or a deadline, usually both in my case. 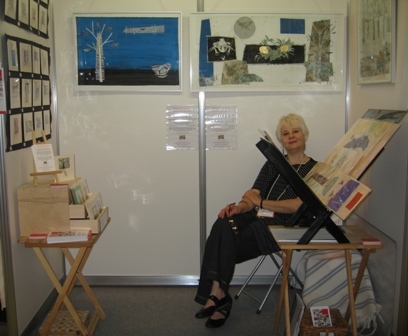 Here’s a wee image of me in my wee stand. Stubled upon your stall in Birmingham and was absolutely smitten with your book! Your daughter was so kind to help me hold the pages which really get quite heavy after a while. Thanks Angelika, it’s a weighty tome indeed, it weighs 12 kilos, or 30 lbs. I’m making another which may be heavier; it’s certainly got bigger pages I think. Time to start weight training…Lovely quilts on your blog.